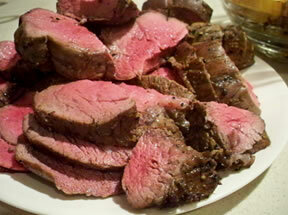 You won't be disappointed in the results of this pricy beef tenderloin. 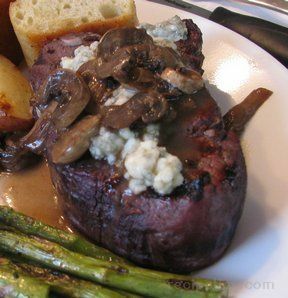 The deep wine sauce with mushrooms, garlic and shallots puts it over the top. Serve this over some mashed potatoes to mop up every last drop of that sauce. 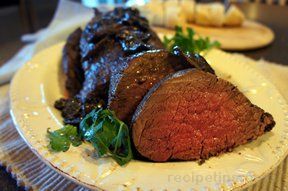 Ask the butcher to trim the tenderloin or do it yourself using a sharp, thin knife to cut away the top layer of fat and the thin membrane called silver skin. Combine the black pepper, salt, lemon pepper, garlic, and thyme; pat mixture evenly over the beef. Cover and let stand at room temperature for 30 minutes. Place a lightly greased rack in a roasting pan. Place beef on the rack. Broil 6 inches from heat for 15 minutes. Reduce oven temperature to 375° and bake 30-35 minutes or until a meat thermometer inserted into thickest portion registers 140° or to desired degree of doneness. Remove from oven; let stand 10 minutes before slicing. 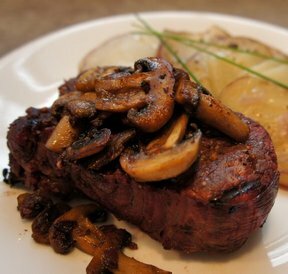 For Portobello Marsala Sauce, melt 1 tablespoon butter in a medium skillet over high heat; add mushrooms, and saute 10 minutes or until mushrooms are browned and liquid is evaporated. Add 1 tablespoon butter, garlic, and shallots to skillet; saute 5 minutes. Stir in Marsala and chicken broth, loosening browned bits from bottom of skillet. Bring to a boil, and cook 20 minutes or until reduced by two-thirds. Remove from heat, and stir in remaining butter. Serve over beef. "Delicious! I broiled it for 15 minutes, reduced heat as directed and baked for 30 minutes exactly and it was done to a perfect medium rare. The crusty peppery coating was great with the sauce. I did decide to use beef broth instead of the marsala wine just because I am not familiar with this wine and didn't want to chance it on this expensive cut of meat. The broth tasted delicious and not sure it could get much better."